Escape the Village Coffee Crowds, Head South! As well as pubs we Radicals sometimes frequent coffee shops (honestly, see the recent post on coffee shops out in Charlton and Woolwich for proof!). 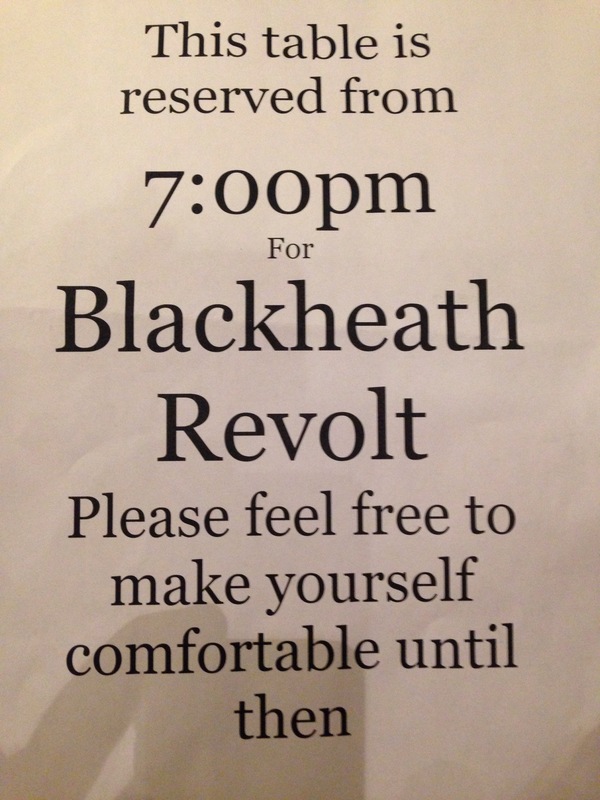 The options in Blackheath are great but their popularity means it can sometimes be difficult to find space to sit down. 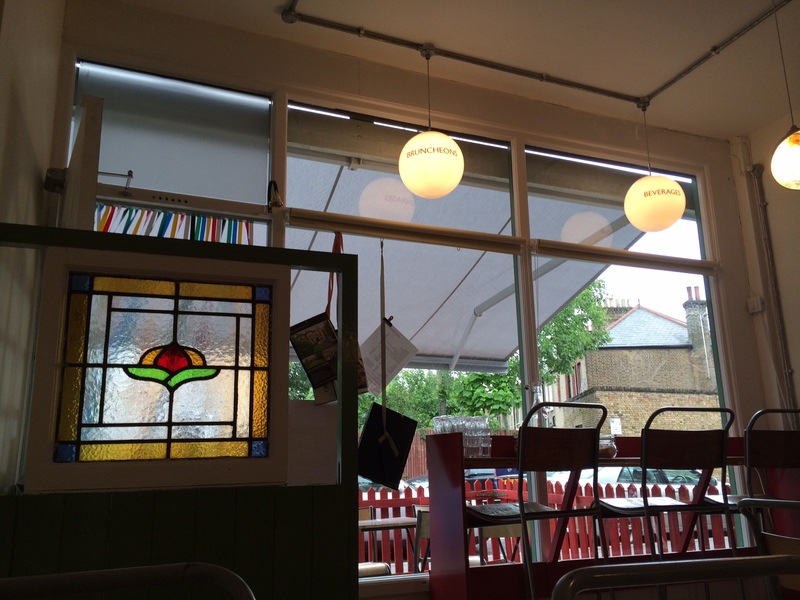 If, like us, you sometimes feel the need to escape the crowded coffee caffeine culture (and Chelsea tractor-buggy traffic jams) of the village, a short meander south provides respite and a few good local coffee shops. With Jam and Bread on Lee High Road, a few minutes walk from Sainsbury’s, opened back in 2011 and has been a great success, serving a good range of coffees and cakes in a comfortable environment. Although don’t try on a Sunday as the staff need a rest! One reason for setting up the café was the lack of places in the local area of the owner. Since then we’ve gained more. 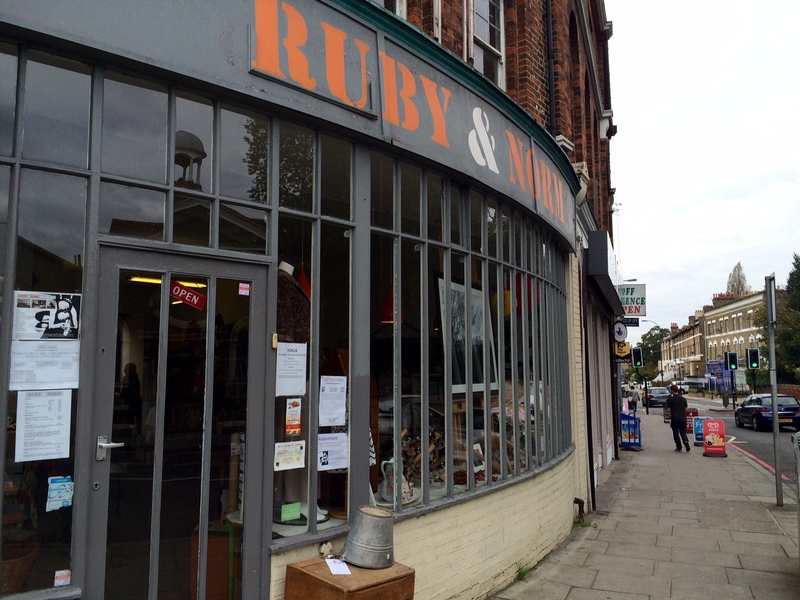 Ruby and Norm is a quirky mix of vintage shop and coffee shop, plus they do light meals too! Situated on Lee High Road, opposite Boone’s Chapel there are comfy sofas, tables and a nice garden area to relax in with the papers. And you may find something a bit different to buy in there too. Oh, and they host numerous classes and gatherings. All in, an excellent idea and worth a visit. A little further, past Manor House Gardens on Manor Park is Archibald’s. Coffee, breakfast, brunch needs are catered for. On a weekend bread from Quaggy bakery in Lewisham can also be bought, but you have to be quick! It has a bit of a retro feel inside – this Radical recalls similar chairs at school – and the outside area is all-weather with heaters, blankets, and screens keeping out the weather as autumn arrives. 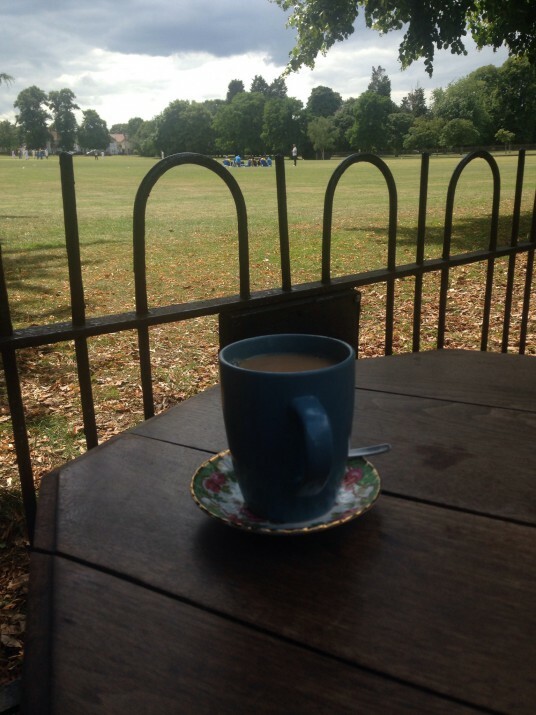 Or if you fancy coffee or ice cream, pop into Pistachio’s in the Park in Manor House Gardens. Handy if you’re visiting the farmer’s market on the first Saturday of the month or are just having a wander around the gardens. We Radicals do like grabbing a coffee in the village but it is sometimes nice to try somewhere new, and all these are independent places that get and deserve local support. Being a Radical and leading the village’s very own Revolutionary movement is of course an edgy business – our campaign for a local cheese shop has certainly had its moments – but we Radicals are first and foremost law-abiding citizens. And so we were naturally very happy when approached by the Blackheath Westcombe Local Policing Team to post what will hopefully be the first in a series of newsletters from the Team. Check it out below and let them, or us, know what you think. The advice on Halloween night is especially timely. No, go on – say what you see. The first person to give the correct answer in comments ‘wins’! It took a little while but eventually the poet-philosopher Radical got it. And so it was, last Thursday, that the full set of Radicals, plus friends old and new, found their way to The Railway for its weekly quiz. For those who don’t know, here is the schedule of quiz nights in the village, as at the time of writing; we hope to get to each of them over the coming months and to give you a blow by blow account. So, back to Thursday and The Railway. We had little idea in advance what type of quiz was about to unfold and as a consequence spent part of the build up swotting up on our known areas of weakness – specifically sport. Between us we learnt something about darts (now forgotten) and something else about football (also now forgotten). After a while we did manage to recall which teams took part in the year’s (was this year?) World Football Cup. Thankfully sport hardly featured! First came the picture sheet, a mixture of guess-who pictures (“Is that a young Eddie Murphy?” It was), cryptic word puzzles (see above) and places/logos. We did pretty well and the consensus was that they were a fun part of the quiz – comprising nine out of 40 questions. The majority of the rest of the quiz was a mixture of questions spanning pop music (we were foiled by a lack of knowledge of Florence and the Machines), geography (which two capital cities in Europe are closet together? ), history, politics, television and an anagram (of DEPOSED). The questions were well paced and easy to hear – the bulk of the teams (around nine in total) were sat in the raised area to the left as you enter. Scores were marked by other teams at half and full time. There were also two ‘free drink questions’ – one of which was secured by our team and delivered to the table (nice touch). Right – how did Team Revolt do? We came second, missing out on top spot by 1/2 a point. We would have won but for a one point deduction for having an extra team member over the six maximum; a very fair deduction in our view. Not a bad effort for our first quiz, though coming top would have been nice. It was slightly surprising to see that once the results were announced pretty much everyone left – including ‘the Penises’ who deserve a special mention for coming last but giving it their all anyway. Keep it up lads! Pun intended. Thanks to The Railway who put on a very entertaining evening which we will definitely do again. But where next? Which is your favourite quiz night in the village or surrounding area? Let us know and we may see you there. Until then, Uvavu! Of course it’s true to say that Blackheath Village can provide for pretty much every need and want – from fresh fish to quality shoe-fittings; fine wine to fine art; natty gents outfits to a bag of chips. It’s even possible once more to buy a copy of the Economist at the station newsagents (though not to read it on a direct train to Victoria!). But we Radicals are nothing if not adventuring types and as a consequence like every so often to venture to parts beyond Tranquil Vale. And as any hobbit will tell you, it’s no good setting about an adventure without first taking time over a decent breakfast. For those who might be similarly inclined we thought it worthwhile sharing our notes on a couple of recent breakfast outings. What do you think? Where else should we visit when out and about and in need of a petit dejeuner? Firstly to Charlton, and the Old Cottage Coffee Shop in Charlton Park. The setting is first rate, with plenty of outdoor seating offering fine views of Charlton House. And it’s the perfect place to watch a game of a cricket – the main reason this Radical is often to be found there on a Sunday morning during the summer. The breakfast itself was very tasty. The ingredients seemed to be good quality (often the sausage is the give-away – and this one was a fine specimen) and the portions decent. When you add in the cost of tea and toast (not included in the breakfast price as they often are elsewhere) it is at the pricey end for a full English. 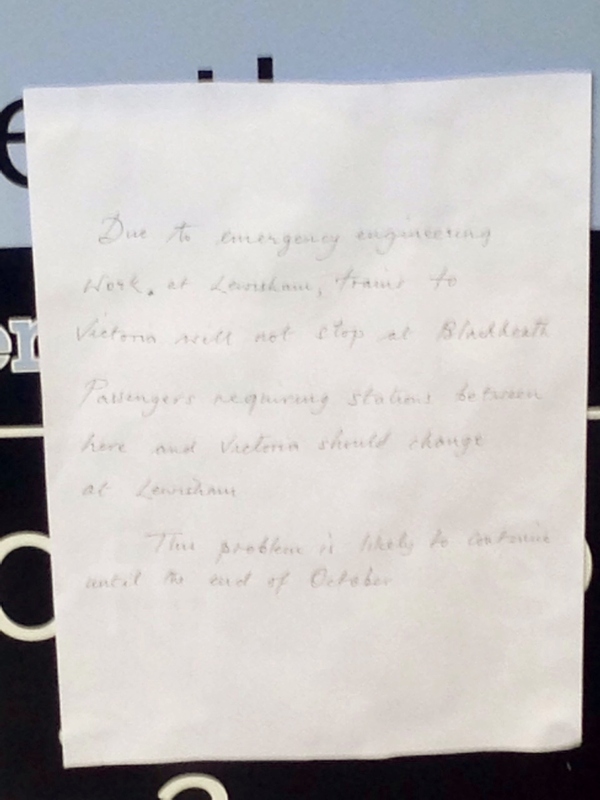 And the service, though perfectly reasonable, was not especially friendly nor speedy – on a relatively busy Sunday that is. As well as the pleasant park setting, the Old Cottage itself is particularly quaint and, in a good way, idiosyncratic – with Tudor inspired wall paper inside, plenty of newspapers to read and very comfortable furnishings. If you ever have elderly relatives with you and want to set them down somewhere safe for an hour or so, this is the place! Next to Woolwich and the somewhat trendier Koffees and Kream. Though quite different to the Old Cottage it is the same reason, sport, which sees your Radicals visit K&K – in this case, the weekly game of squash. Yes, yes – you may well ask go to the effort of playing (a term to be used very loosely) squash for 40 minutes and then having a full English breakfast. To which there is no convincing answer so we’ll settle for ‘yin and yang’ and leave it at that. K&K, despite the annoying mis-spelling in its name (presumably it’s meant to be kool? ), is actually a fantastic addition to Woolwich. 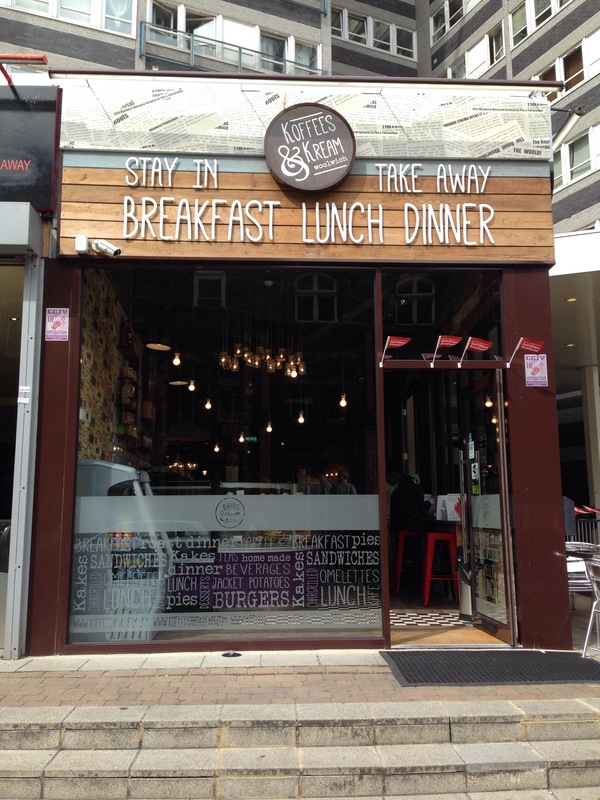 It has a very relaxed vibe, a sort of cross between an American diner and a high-end coffee bar. The décor on the out and inside is very well done and the whole place feels comfortable, fresh and welcoming. 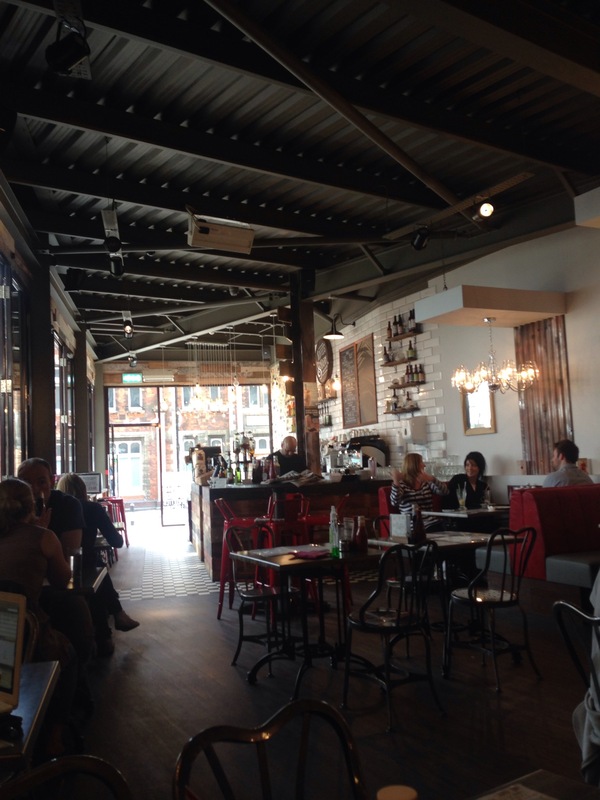 The free wifi is also very good – this is the sort of place you could spend some time working on the laptop whilst drinking the pretty decent coffee. Again the service, at least on our first visit, was nothing special. Unfortunately there was a mix-up with the order which meant the breakfast took rather longer to arrive (two mugs of tea to be exact) than you would expect, but this was an exception and the manager was apologetic etc. when made aware. 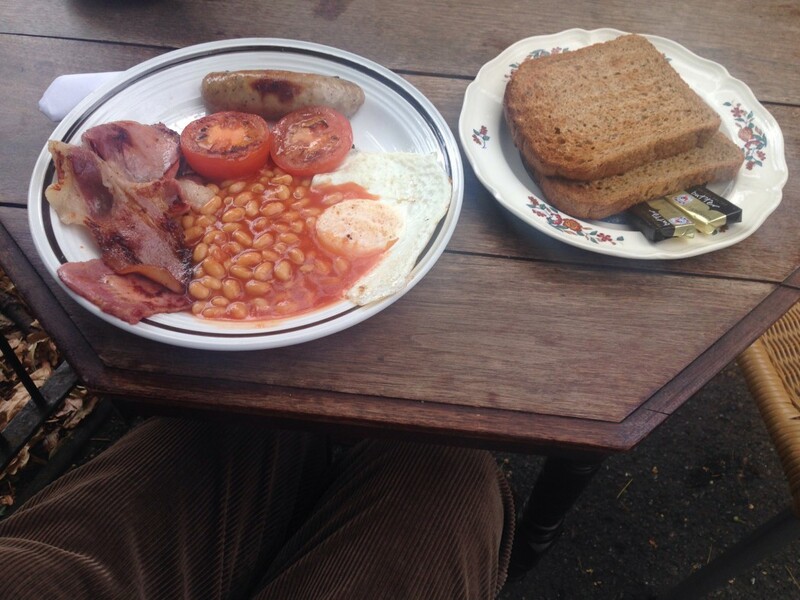 The breakfast itself was pleasant when it arrived; good quality bacon, decent quantity of beans and nice toast. And it was well priced. They do breakfast, lunch and dinner and have a license so there are plenty of reasons to pop along. And, apparently, K&K is already a bit of a hit amongst the SE18 crowd. It hosts popular evenings of music – such as Soul Funk R&B nights from 7pm to midnight. Not really our scene but great to see a place trying this sort of thing. And as a result K&K has a healthy Twitter following (@KoffeesandKream). We’ll certainly be back, so be warned – if you see three figures panting in the corner with squash rackets strewn about the place, keep back!